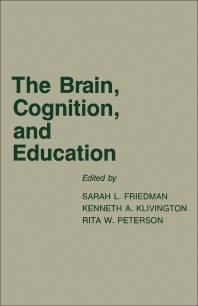 The Brain, Cognition, and Education is a collection of papers that deals with cross-disciplinary communication. This book addresses the use of concepts, methodologies, and research results from other experiments in the conduct of finding new knowledge. One paper addresses the relationships among neuroscience, cognitive psychology, and education to arrive at cross-interdisciplinary communication. Other papers discuss attention, the brain, and the control of cognition; one paper notes that selective attention as a cognitive system with its own measurable features can be associated with underlying neural systems. Other authors deal with acquiring, representing, and using knowledge such as language learning, interplay between mind and experience, as well as the neuropsychology of memory. One paper examines infantile amnesia when early life experiences tend to be forgotten. The book then addresses cognitive and neural development, including neural developments before birth covering neurogenesis, cell migration, dendritic maturation, and synaptic development. One author reviews trends and directions in cognitive development and cites the works of Piaget, Simon, and Chomsky. One author presents several models of memory functions, while another author evaluates the possibilities of building bridges between education and the neurosciences. Many psychologists, neuroscientists, phoneticians, philosophers, and linguists will appreciate this book very highly. 5. Biological Preprogramming for Language Learning? V. Can the Influences of Instruction be Studied Directly?